Swastik is the symbol of Ganapati or Ganesha, the Lord of Ganas, the elephant faced God, represents the power of the Supreme Being that removes obstacles and ensures success in human endeavors. He is revered as the son of the Shiva and Parvati, and is always honored first in most worship services and rituals. Swastik Pyramid is the sign of lord Ganesha and pyramids are embossed on it . This is an auspicious item to keep in the home. You can fix it on the outer wall of your house or room. This Swastik Pyramid not only brings positive energy but also brings Good Luck to the person as well as remove all obstacles in all undertaking. 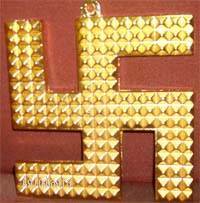 This Swastik pyramid is made up of brass and is Gold plated in glass frame for long life. Swastik Ganesha is also one of the five Gods the worship of whom was popularised by Adi Shankaracharya; the other four are Vishnu, Shiva, Devi and Surya. The worship of these five deities is called the pancayatana puja. In some cases, a sixth God, Skanda is also worshipped. From time immemorial the symbol of Ganesha , Swastik is being used as Luck Charm, i.e It is believed where there is the Ganesha symbol, nothing bad can happen. Swastik is drawn on the gates to prevent houses from evil eyes. As an auspicios item Astroshastra presents the Brass Swastik which you can paste on your doors or outer walls of your houses to prevent your home from evil eyes and bring positive energy in the home. Swastik is one of the best solution to all vastu problems.